by John Hoddinott, Harold Alderman, Jere R. Behrman, Lawrence Haddad, and Susan Horton. This paper outlines the economic rationale for investments that reduce stunting. We present a framework that illustrates the functional consequences of stunting in the 1000 days after conception throughout the life cycle: from childhood through to old age. We summarize the key empirical literature around each of the links in the life cycle, highlighting gaps in knowledge where they exist. 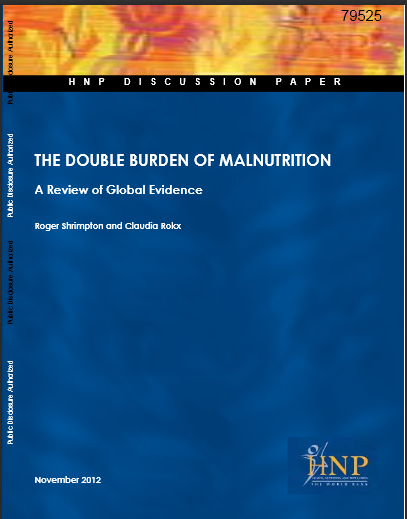 We construct credible estimates of benefit–cost ratios for a plausible set of nutritional interventions to reduce stunting.There are considerable challenges in doing so that we document. We assume an uplift in income of 11% due to the prevention of one fifth of stunting and a 5% discount rate of future benefit streams. Our estimates of the country-specific benefit-cost ratios for investments that reduce stunting in 17 high-burden countries range from 3.6 (DRC) to 48 (Indonesia) with a median value of 18 (Bangladesh). Mindful that these results hinge on a number of assumptions, they compare favourably with other investments for which public funds compete. Economic growth is widely regarded as a necessary, and often sufficient, condition for the improvement of population health. We aimed to assess whether macroeconomic growth was associated with reductions in early childhood undernutrition in low-income and middle-income countries. We analysed data from 121 Demographic and Health Surveys from 36 countries done between Jan 1, 1990, and Dec 31, 2011. The sample consisted of nationally representative cross-sectional surveys of children aged 0–35 months, and the outcome variables were stunting, underweight, and wasting. The main independent variable was per-head gross domestic product (GDP) in constant prices and adjusted for purchasing power parity. We used logistic regression models to estimate the association between changes in per-head GDP and changes in child undernutrition outcomes. Models were adjusted for country fixed effects, survey-year fixed effects, clustering, and demographic and socioeconomic covariates for the child, mother, and household. Sample sizes were 462 854 for stunting, 485 152 for underweight, and 459 538 for wasting. Overall, 35·6% (95% CI 35·4–35·9) of young children were stunted (ranging from 8·7% [7·6–9·7] in Jordan to 51·1% [49·1–53·1] in Niger), 22·7% (22·5–22·9) were underweight (ranging from 1·8% [1·3–2·3] in Jordan to 41·7% [41·1–42·3] in India), and 12·8% (12·6–12·9) were wasted (ranging from 1·2% [0·6–1·8] in Peru to 28·8% [27·5–30·0] in Burkina Faso). At the country level, no association was seen between average changes in the prevalence of child undernutrition outcomes and average growth of per-head GDP. In models adjusted only for country and survey-year fixed effects, a 5% increase in per-head GDP was associated with an odds ratio (OR) of 0·993 (95% CI 0·989–0·995) for stunting, 0·986 (0·982–0·990) for underweight, and 0·984 (0·981–0·986) for wasting. ORs after adjustment for the full set of covariates were 0·996 (0·993–1·000) for stunting, 0·989 (0·985–0·992) for underweight, and 0·983 (0·979–0·986) for wasting. These findings were consistent across various subsamples and for alternative variable specifications. Notably, no association was seen between per-head GDP and undernutrition in young children from the poorest household wealth quintile. ORs for the poorest wealth quintile were 0·997 (0·990–1·004) for stunting, 0·999 (0·991–1·008) for underweight, and 0·991 (0·978–1·004) for wasting. A quantitatively very small to null association was seen between increases in per-head GDP and reductions in early childhood undernutrition, emphasising the need for direct health investments to improve the nutritional status of children in low-income and middle-income countries.